On February 7, 2016, named as the NFL MVP and with the plaudits rolling in, the world seemed to be at Cam Newton's feet. The then 26-year-old had thrown 45 total touchdowns during the regular season and led NFL quarterbacks in rushing attempts, yards and touchdowns for the year, helping the Panthers to a franchise regular-season best of 15-1. But, then came a devastating 24-10 defeat to the Denver Broncos in Super Bowl 50 later that day, before an alarming regression in the 2016 season. Newton fell far short of the heights he hit the previous year. He finished 2016 with a career-worst 52.9 pass completion percentage, having thrown 14 interceptions - the second-most of his six-year career at that stage. Although the 2017 season saw an improvement from the Panthers - an 11-5 regular season record - Newton still fell below the high standards he set two years previous. And, while he threw two touchdowns in the Wild Card playoff defeat against the New Orleans Saints, the Panthers were still beaten by their division rivals. This year, Newton looks to have rediscovered the 2015 flair and form which helped lead Carolina to the Super Bowl promised land. A win against the in-form Pittsburgh Steelers - who are on a four-match winning streak - when the two meet on Thursday Night Football would confirm the Panthers are capable of making another such run in the playoffs. 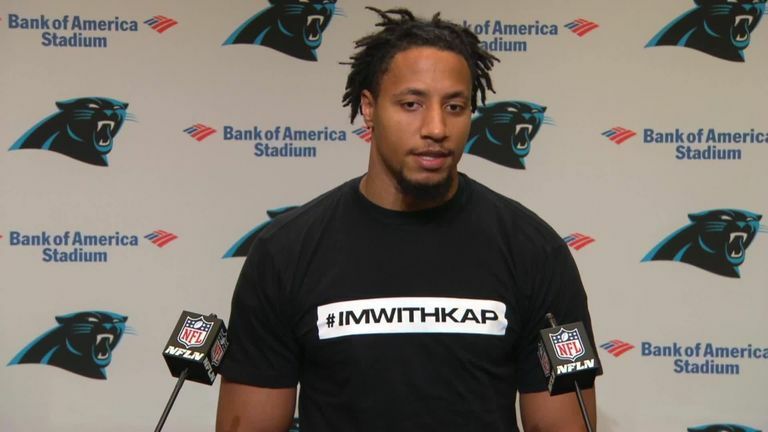 Any doubts over whether Newton and this Carolina team are capable of going deep into the postseason have been dispelled over the past few weeks. A mixed 3-2 start has been followed by a three-game win streak in which they have downed the defending champion Philadelphia Eagles, the Baltimore Ravens and their No 1 defense and then ran up the score against divisional rivals Tampa Bay Buccaneers. 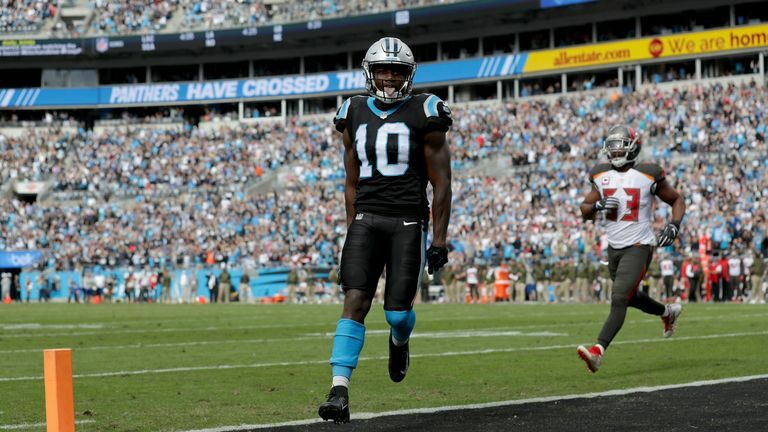 Curtis Samuel scored a double-reverse 33-yard touchdown against the Buccaneers in Week 9. The streak started with a scintillating 21-17 comeback win over the current Super Bowl champions the Eagles in Week Seven - Newton rallying his team after trailing 17-0 going into the final quarter. The Carolina quarterback strung together two touchdown drives to put up 14 unanswered before, on what proved to be the game-winning drive, the quarterback remained calm on 4th-and-10 and hit wide receiver Torrey Smith for a 35-yard catch and run to keep the team alive. Nine games into the season, Newton has already thrown 15 touchdown passes and picked up four rushing TDs - just nine less in total than what he managed over the entire 16-week season in 2017. 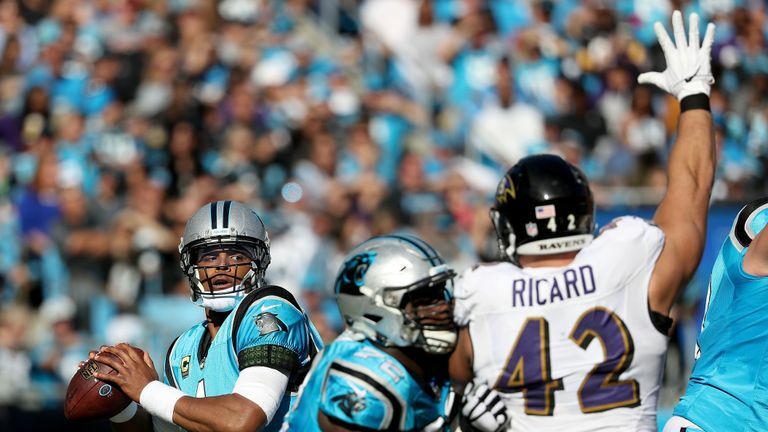 Highlights from the NFL as Baltimore Raves took on Carolina Panthers in Week 8. New Panthers offensive coordinator Norv Turner has undoubtedly had an effect on Newton, with the former San Diego Chargers head coach, and veteran NFL offensive guru, honing his new quarterback's skills rather than looking to change them. Newton has always been as likely to throw from the pocket as he is to pick up yards running the football. He is second only to Christian McCaffery in rushing yards for the Panthers this season. And, rather than attempt to turn Newton into a pocket passer, as many have tried - and failed - to do previously, Turner has looked to gradually ease in such components, such as introducing more check-down passes than the team have previously been accustomed to. The result? Newton has currently completed a career-high 67.3 per cent of his passes this season, compared to his seven-year career average of 59.0. Improvements in the Carolina offensive line have also aided Newton, with the team allowing only 12 sacks. Week Seven's incredible turnaround against an Eagles pass-rush that stopped Newton and the Panthers from making a play in the red zone until the fourth quarter was a statement. It's a statement that has been backed up by the team's streak since and has many believing 'SuperCam' and the Panthers can be considered contenders once more.